This makes me crazy, crazy mad. Attack the government and it's policy, but don't ever say that the men who follow this policy died in vain. It is insulting to all those serving and their families. You say, "Of course, the Department of Defence assures us that their lives were not lost in vain, and that they will be remembered forever for their sacrifice. But this is just hollow rhetoric." Perhaps, to you it is hollow, but ask all those who march on April 25th why they are marching, ask those who bow their heads in quiet thankfulness on November 11 who they are thanking, ask any wife, mother, child of a serving member, especially those deployed around the world who is foremost in their minds at a time like this. I can guarantee that these men will be remembered. Pull your head in and thank your lucky stars that there are men and women who are willing to fight for you, your country and the freedom that you enjoy, because it is clear from your remarks that you aren't willing to stand up and support those who do, let alone serve yourself. I have nothing interesting to say, or to show......nothing at all. The battery charger for my camera has given up the ghost, so there are no photos. I have decided that the Little Roses look terrible and have pulled them out. 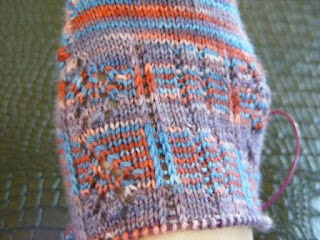 I have cast on another pair of socks but with only five days left of March, and being only half way up the foot on both socks, I can't see them being finished in time. No photos either, see first point. I have been in holiday mode ever since Soldier has been home from deployment and is on leave. Hardly any housework has been done and the house now looks like a tip. So I have not been knitting, but cleaning kid's rooms, scrubbing bathtubs, trying to tackle Mount Washmore, etc. On a brighter note, I did score some 100% Australian wool yarn for $2 a ball yesterday. It is a creamy white and I will try some dying with food colouring again. Maybe by then the camera will be operational and I will have something to say! We did manage to make it to the beach today. We ended up at Cronulla, somewhere I had never been before. It was a little windy, but the sun was hot and we had a great time. 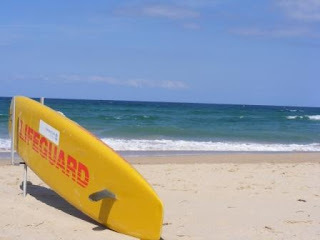 We watched a lot of kids from nearby schools surfing and bodyboarding. 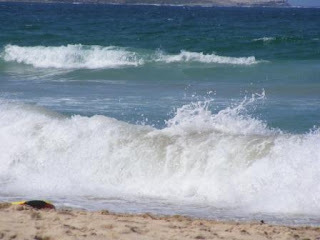 Then just as abruptly as they all turned up, they left again and we had the beach almost to ourselves. After lots of sand eating, seagull chasing, sand dune climbing and sandcastle building we packed up and went home. Very tired, but very happy! Now that the kids are fed and bathed and in bed, I thought I might pop in and say hi. Hi! I really should be tackling the ginormous pile of clean washing that requires folding, but you cannot rush these things. My Mum has gone home after a week long stay. I love having her here and I wish that we still lived 400 kilometres apart instead of 1400 kilometres. The kids got spoiled and she loved every minute of it. We did some shopping, saw a movie and generally caught up with each other. I have been working away on the little roses. I didn't like how they were working up and I thought that it might be the fault of the pattern and the yarn not being compatible. I decided to do one more repeat and see if I changed my mind. I really liked the look of the second repeat and wondered why. Can you see it? It seems that I somehow have the ssk in the wrong spot on both sides of the sock, and also on both socks. I don't know how I managed to do that, but I have always been special! I have decided that I can live with it and will knit on. I should get a lot of knitting time tomorrow. 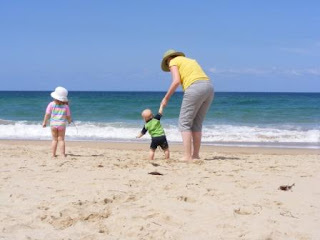 We are taking advantage of Soldier's holidays and are going to have a family outing to the beach. 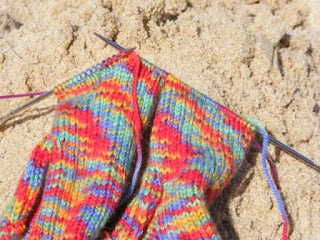 I am not much of a swimmer and I burn really easily, so I predict a day of hiding from the sun making a lot of progress on the socks. Our wonderful ADSL2+ internet speed has been throttled back to 64k and it is killing me. Ever since Soldier has been home he has been downloading like a fiend. He has gone over our extremely generous download limit and he is in trouble! I can't stalk those I currently stalk, I can't look at sock yarn I would like to buy (this maybe a good thing), I can't update my status on Facebook, I can't blog myself - it took me 6 minutes just to open blogger to type this. I will be back soon, once I am not so cranky with my slow internet!! I have been watching the Bureau of Meteorology website for the last few days, keeping an eye on TC Hamish. He is currently a category 5 system, which is the highest rating. Near the eye he will packing winds of up to 295 kilometres per hour. Very, very scary stuff. I have a lot of family up in North Queensland, some who went through TC Larry, and have been worried about them. It looks as if he is going to continue to skirt the coast and not give them any trouble, but he could turn right and cross the coast at anytime. My Mum is supposed to be flying down to spend some time with us tomorrow afternoon. Hopefully Hamish will behave himself and the airport will remain open. Noo is very excited to see her Gran! The last thing anyone in North Queensland needs at the moment is a cyclone and the torrential downpours that accompany them. Luckily my parents house wasn't damaged in the floods in Mackay of February 2008, but there will be a lot of nervous people whose properties were inundated, wondering if it is all going to happen again. are done!! They are a little late, but that's ok because it is my personal sock club and I make the rules so I can break them. There are two of them, but Noo has been wearing them since they were finished and I could only pry one of them off her little foot. I got exactly two photos and then they were back on. Sorry about the bad photo, it is really difficult to direct a squirmy three year old that doesn't want to stand on a chair to amuse her Mum. Also ABC Kids was on and she was itching to go and watch Play School. They are a little big at the moment, but that is fine because she is growing like a weed. That is The Boy in the background. He is nearly ten months old now and into everything. He is crawling and cruising along the furniture. He adores his big sister and is very rarely very far from where she is. There has been a few other knitterly things going on here too. 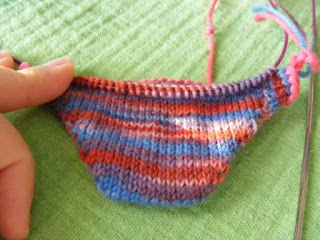 I have cast on for the February Lady Sweater using my new Knit Picks interchangeable set. I have been stalking a set of these for ages. I managed to get a day away from the kids on the weekend and made a trip into the city and got myself a set. I am impressed with them at the moment, but we will wait and see when they get a lot more use. There are no photos of the FLS because I have only knit about 6 rows. After finishing the Little Witches I dragged Soldier to the drawer where my sock yarn lives and told him to choose a skein. He immediately chose a lovely skein from One Fat Slug that my Mum bought me for my birthday. They are to become a pair of Little Roses. I spent a little time last night with an excel spreadsheet adjusting the pattern to work over 72 stitches and then I cast on while watching Cold Case last night. 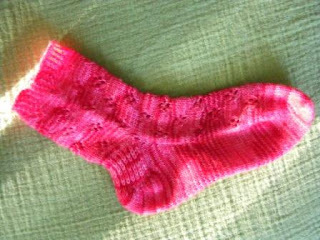 I will knit them two at a time and toe up again, just for something different!! It seems that my 2.5mm circs are going to get a good workout this year.